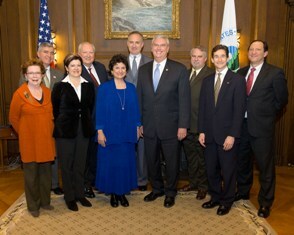 Photo (L to R): Carole Baker, AWE; Pete DeMarco, IAPMO; Sarah Yerkes, ICC; Allen Inlow, IAPMO; Mary Ann Dickinson, AWE; Jack Krecek, PMI; Administrator Stephen Johnson, EPA; Kevin Tindall, PHCC Member; Assistant Administrator Ben Grumbles, EPA; and Ike Casey, PHCC. (Washington, D.C. – Jan. 6, 2009) Five national organizations are joining forces in a historic partnership to further research into water efficiency in plumbing. These organizations with expertise in water efficiency and plumbing will develop research programs to assist in the development and use of water efficient plumbing. The research will cover efficient and sustainable products, systems and practices.